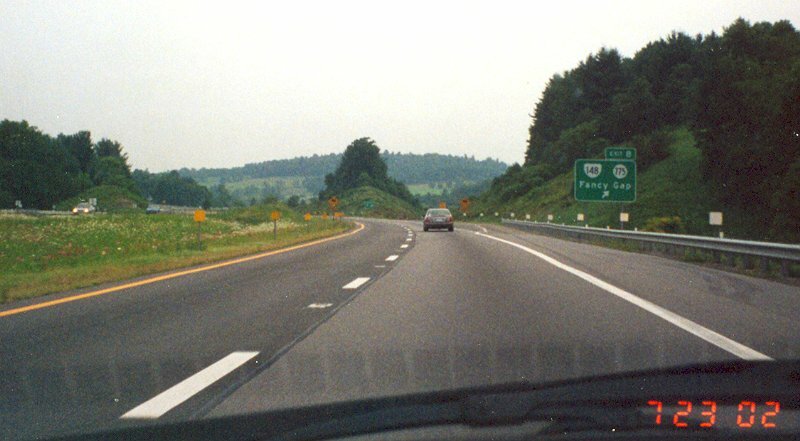 Northbound on I-77 at the VA 148 exit. 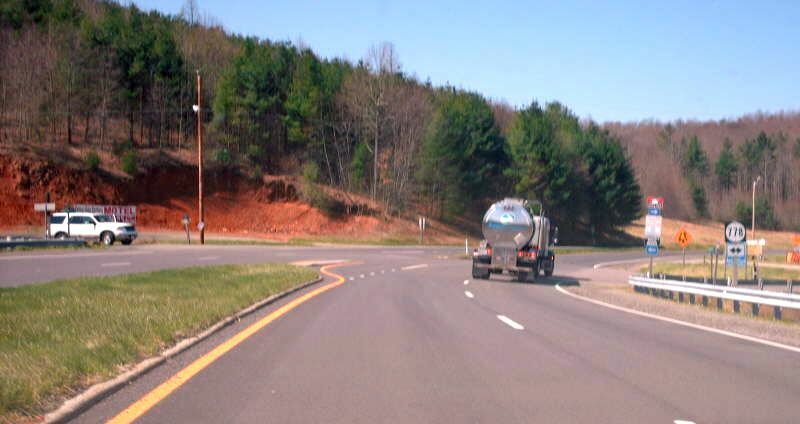 VA 148 is a short connector between I-77 and US 52 near Fancy Gap. 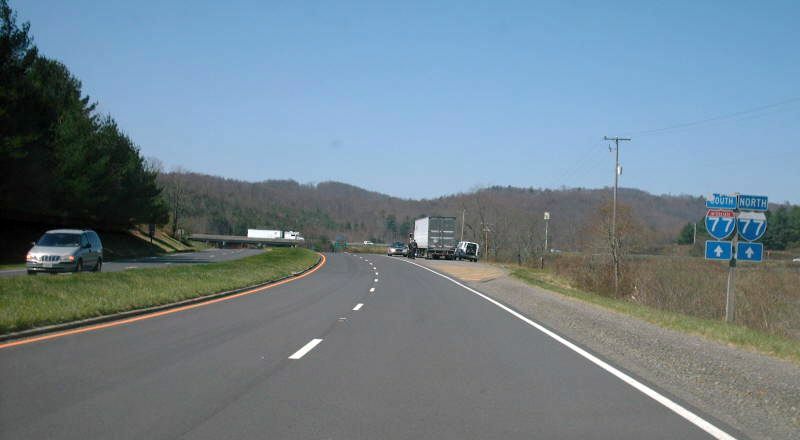 It is also used with US 52 as an access between I-77 and the Blue Ridge Parkway. Photo by Adam Froehlig, taken July 23, 2002. Here is a wider, higher view. Did I rent a helicopter? No...this is from the nearby SR 683 overpass. Photo by Mapmikey, taken April 13, 2007. 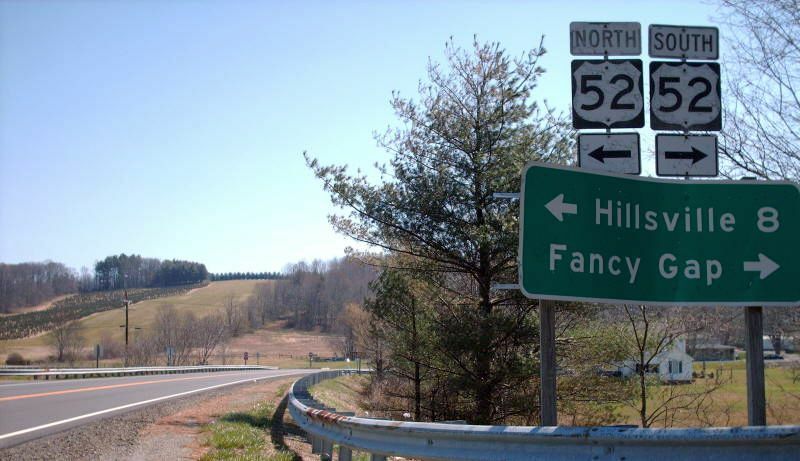 Cool...new US highway routes! Wait a minute! Major sign goof as one heads down the NB off-ramp from I-77. The 775 shield should be a Virginia Secondary Route shield, while the 148 shield should be a Virginia Primary Route shield. Photo by Adam Froehlig, taken July 23, 2002. Eastbound VA 148 leaving I-77. All 148 shields were bannerless. Photo by Mapmikey, taken April 13, 2007. Westbound VA 148 approaching its end at I-77. Photo by Mapmikey, taken April 13, 2007. 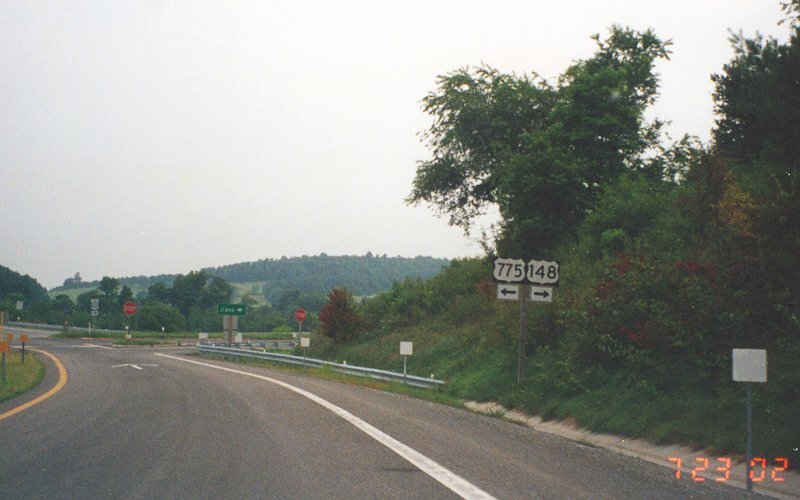 Westbound VA 148 just past I-77 is posted to SR 778, shown crossing ahead. Photo by Mapmikey, taken April 13, 2007. 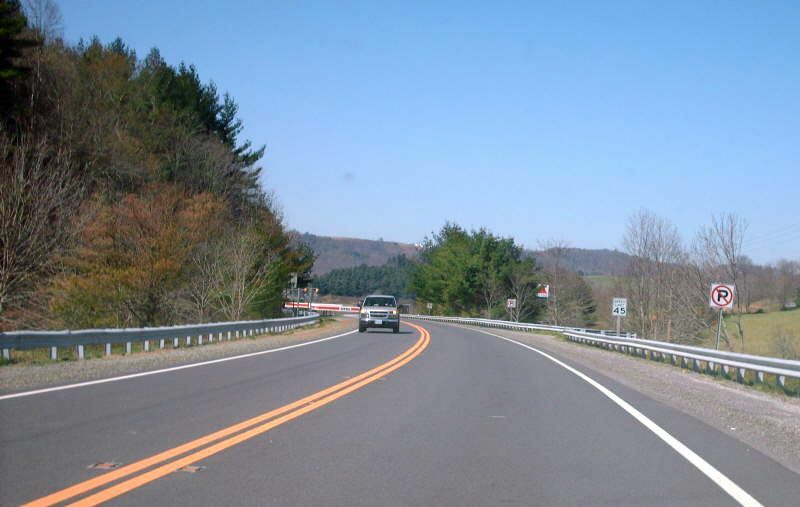 Northbound SR 778 at VA 148, posted with a rectangle. Photo by Mapmikey, taken April 13, 2007. 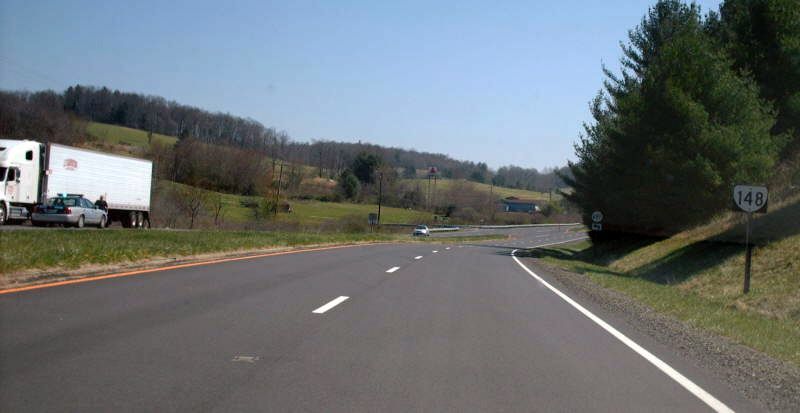 VA 148 as shown from US 52 northbound. Photo by Mapmikey, taken April 13, 2007. VA 148 as shown from US 52 southbound. Photo by Mapmikey, taken April 13, 2007. 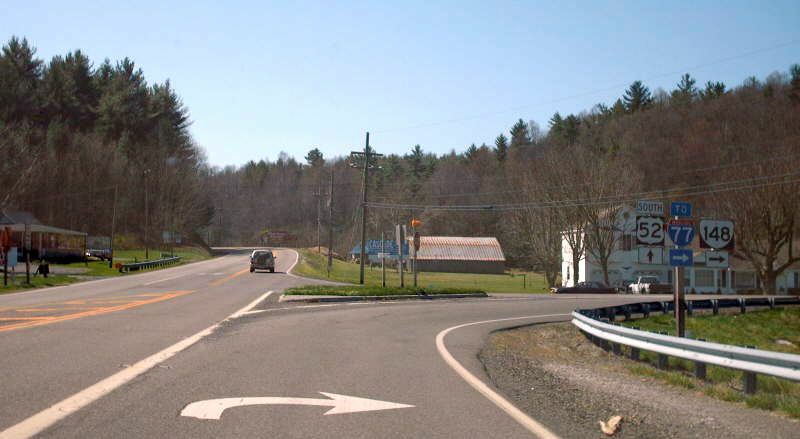 Beginning down VA 148. Photo by Mapmikey, taken April 13, 2007. Just a little further is this reassurance marker. Photo by Mapmikey, taken April 13, 2007. VA 148 approaching its end at US 52. Photo by Mapmikey, taken April 13, 2007.